July’s AGM (our ninth!) was yet again testament to how much interest the building generates and how passionate people are about keeping swimming there. There was a good discussion about the future strategy of the group and some very positive reportbacks from our elected officers. Mark Gunton remains as Treasurer, Philippa Webster was re-elected as Secretary and we welcome Viv Harrison as our new Chair, with our thanks and appreciation extended to outgoing Chair Jen Austin for her hard work and commitment to the Baths, which precede even the formation of our group! Members of the group have been participating in a working group which has been set up to explore the feasibility of keeping the building open beyond the planned closure at the end of 2016. At our AGM we reaffirmed our commitment to keeping swimming at Moseley Road Baths and gave members a remit to lobby for a publicly owned and managed swimming facility to remain on site. 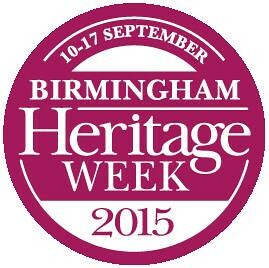 Birmingham’s Inaugural Heritage Week takes place Thursday 10th September – Thursday 17th September. Throughout the week there will be a wealth of fascinating events, exhibitions, talks and tours that provide a wonderful insight into the diversity of the city’s cultures and heritage. Following on from last October’s hugely successful collaboration with Fierce Festival, the Friends of Moseley Road Baths will be hosting Birmingham Heritage Week events at the Baths, from 10th-17th September. The highlight of the event will take place on Friday 11th and Saturday 12th. Over the two days, eight artists with Birmingham connections will present new and existing work in the usually closed washing baths. There will also be a programme of short films curated by Kino 10. This programme, titled Slip, is co-organised with Fierce Festival. Featured artists include Alek Wojtulewicz, Annie Mahtani, Emily Warner, Sarah Farmer, Sheila Ghelani, Sophie Bullock and the duo Under The Plans. The artists’ work can be viewed from 4-8pm on Friday 11th September and from 10am-4.30pm on Saturday 12th September. Entry to the works is free. In tandem with the arts event, on Saturday 12th, the Friends Group will be conducting guided tours around the Grade II* listed building, including areas not usually open to the public. These tours will start at 12, 1, 2 and 3pm and will usually last about 30-40 minutes. Places are limited, so please arrive early. Also on Saturday, between 1 and 2pm, there will be an allotted hour’s free swimming to encourage visitors to not only see the building, but experience it. Please note that these places are limited for the designated hour. Buoyancy aids can be provided. Any queries can be sent to events@friendsofmrb.co.uk. For the remainder of the Heritage Week, and beyond, the swimming pool will be open at the times shown on www.birmingham.gov.uk/moseleyroadpool, so that visitors can bathe in over one hundred years of history and heritage. Pool of Memories – Coming to a school or library near you? With the new school year looming (I hear your cheers and sighs in equal measure! ), we wanted to draw your attention to some of the excellent resources that the Friends of Moseley Road Baths have developed over the course of our ‘Pool of Memories’ project which ran from 2010-13. 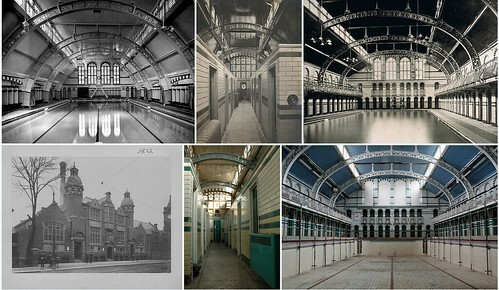 Our website, www.poolofmemories.co.uk, hosts just a taster of some of the resources that the Friends of Moseley Road Baths created through our three year Heritage Lottery Funded Project. Have a browse and listen to Oral History recordings, watch video interviews and download worksheets. If you are interested in developing a project around the history of the building, please contact Rachel on memories@friendsofmrb.co.uk. 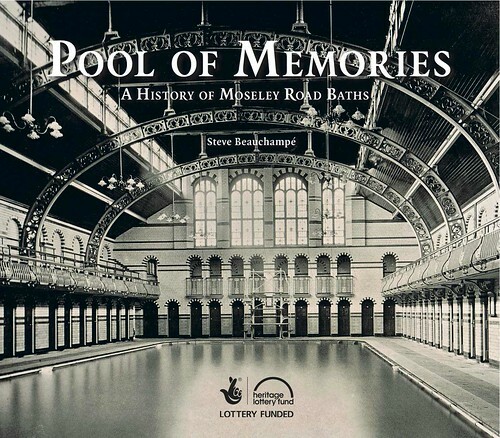 Spreading our work yet further, on Saturday 5th September, some of the Friends of Moseley Road Baths will be travelling to community libraries around Birmingham to deliver copies of their ‘Pool of Memories’ book. Some of the libraries local to the Baths, including the new Library of Birmingham (LOB), were given copies at the time of publication, so the Friends contacted each of the remaining libraries under the LOB umbrella offering to donate copies to each. Of the 33 contacted, 11 kindly requested copies for their stock. Starting at the Baths, the Friends will travel clockwise around Birmingham, taking pictures at each opportunity, to arrive at Stirchley Library, located next to Stirchley Baths, which will be hosting an open day. Film and Photography Moseley Road Baths is quite understandably extremely popular as a location for film and photography. Many of you have contacted us asking about using the building as a location. Film Birmingham is the body responsible for co-ordinating and supporting film and photography work across the city and they require any shoots to be insured and risk assessed. Most students will be covered by the insurance of their college or university and many professionals should have adequate Public Liability Insurance, but it is worth checking. You can fill in the on-line form or just phone them on 0121 675 3883 to learn more about what you need to put in place before you start work. We also ask that you speak with the Pool Manager, Dave Flora, to see if you can be accommodated. The pool number is 0121 464 0150. Please be aware that staff are unable to work outside of normal pool hours and that access to the building is restricted. Birmingham Heritage Forum We have now joined Birmingham Heritage Forum. Birmingham Heritage Forum members are organisations concerned with collections, historic sites, museums, galleries, churches, gardens and visitor services, within the Birmingham area. The Heritage Forum was established in 1991 by Birmingham City Council. Since 1997 it has been an independent society run by a committee of volunteers. Discover more about Heritage sites and projects across the city on the Birmingham Heritage Forum website. We have a new set of beautiful postcards available featuring both archive and current images of the building. Grab a set of either Black and White or Colour postcards from stalls and events or contact us directly at contact@friendsofmrb.co.uk. Meetings are friendly and informal and we welcome new faces and fresh ideas! Could you help us out during the Heritage Week and Fierce Festival? If so then e-mail events@friendsofmrb.co.uk.